Dear believers with grand requests: grace, mercy, and peace to you from God the Father, and our Lord and Saviour Jesus Christ. Amen. It is easy to criticize James and John over their request to be seated, one at the right hand and one at the left hand of Christ in His glory. Their request sounds arrogant and prideful. Maybe we, like the other disciples, feel a little indignant with them since we would like one of those places for ourselves. But in making this request to Jesus, James and John showed that they had actually listened closely to what Jesus had taught them. Jesus had promised that when He sits on His glorious throne, they too would sit on thrones judging the twelve tribes of Israel [Mt. 19:28]. Jesus also taught them that if two of them agree on earth about anything they ask, it will be done for them by their Father in heaven [Mt. 18:19]. So James and John, keeping these promises in mind, came to Jesus, and asked that this might be done for them. This is exactly what a Christian is to do, to grab hold of the promises of God, and bring these promises before God when they pray to Him. Yes, this is a grand request, but so what? If the king of a great kingdom offers a poor wandering beggar anything that his heart desires, for what should he ask? Should he ask for a mere morsel of bread? When this poor beggar could ask for anything, if he requested a mere crumb of bread, would he not offend the king? Would not everyone hold this beggar to be audacious and thankless for asking for next to nothing when everything is offered him? Would he not be making a mockery of what the king offered him? So we also dishonour God and rob Him of glory if, instead of asking Him for the great treasures He has promised us, we ask for mere trifles. So James and John come to Jesus, and trusting His promises, make their request known to Him. Notice that Jesus does not rebuke them for their request, nor does He say that their request is too great. He replies, “You do not know what you are asking.” They did not understand what Jesus kingdom is, or where it is. They did not comprehend that Jesus’ kingdom is not of this world [Jn. 18:36]. They wanted to be in Jesus’ glory, but they did not understand what or where His glory is. They sought glory in this life. They wanted to rule over others in this life. Now we see the lack of understanding of James and John. Jesus asks them, “Are you able to drink the cup that I drink, or to be baptized with the baptism with which I am baptized?” They respond, “We are able.” They neither understood for what they asked nor what they answered. They wanted to be rulers in Jesus’ earthly kingdom, drinking the cup of victory with Jesus in His kingdom. They wanted a baptism of initiation into their role as rulers over others. They were so ready to answer because they did not understand what Jesus was saying. The question is not one of your actual position in life. The question is of your attitude and behaviour toward others. Those who are “great” and “leaders” among you, are to be humble and serve others, just as those who are “lesser,” or “younger,” or of lower status are also to serve others. This is a reversal of what the world holds to be true, where those who serve are considered inferior. Jesus says that the humble servant, the slave of all, is great and first. Where does that put you? How willing are you to serve others? Or how often does your selfishness get the better of you and drive you to think of yourself first? How often are you willing to take advantage of others, so that you might benefit? How often do you want to be great so that you can lord it over others? Jesus had just finished foretelling His disciples of His upcoming death, how He would be delivered over to the chief priests and scribes and be condemned to death. He told of how He would be mocked and spat on, flogged and killed [vv. 33-34]. James and John follow this by asking for positions of honour and glory in this life! They did not grasp what Jesus said or what He was about to do. When you pray, do you ask God for glory and honour in this life? Do not fall into the same misunderstanding as James and John. Hear what Jesus says about glory to understand what James and John missed. Jesus explains His glorification to the disciples at another time in connection with a grain of wheat falling into the earth and dying [Jn. 12:23-24]. Jesus’ death and burial were a necessary part of His glorification, just as a grain of wheat must fall into the earth and die in order to bear much fruit. The Son of Man was glorified when the ruler of this world was cast out, when Jesus was lifted up from the earth on the cross [Jn. 12:27-32]. The glory Jesus is talking about is His cross. The glory Jesus is talking about is not just His resurrection and ascension, but also His upcoming suffering and death. It might be said that James and John did drink of the cup of which Jesus drank and were baptized with the baptism He was baptized with, in that James was martyred [Act. 12:2], and John suffered tribulation and was exiled [Rev. 1:9]. But there is much more to this. Jesus drank the cup of the wrath of God. He drank the devastation and destruction, the famine and sword that we deserve for our sins. Jesus became a desolation and a waste, a hissing and a curse for our sins. In great distress, Jesus was baptized with the fire that we deserve to be thrown into. He was baptized by the eternal wrath of God. In taking the wrath of God upon Himself, Jesus saved us from the wrath of God [Rom. 5:9], cancelling the record of debt that stood against us with its legal demands [Col. 2:13-14]. He drank the cup of God’s wrath, so that now the cup for us is no longer a cup of wrath, but is the cup of the new testament in Jesus’ blood. Instead of being full of wrath, it is full of forgiveness, life and salvation. We receive the benefits of Jesus drinking the cup of wrath when we drink of the cup of life offered to us in the Lord’s Supper. Jesus was baptized with the fire of God’s wrath, so that now Baptism for us is a Baptism into Christ’s death, and we are united with Him in His death [Rom. 6:3-5]. We received the benefits of Christ’s life and death in our Baptism. In our Baptism, we received the benefits of Christ’s Baptism in the fire of the wrath of God. 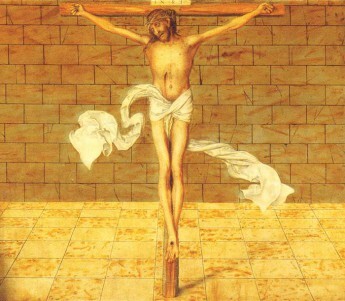 This is the glory of the cross. The glory of God is seen in Christ on the cross, because this is where we see the true heart of God, where we see His love for mankind. This is the glory of Jesus. This is where Jesus took our place so that we could spend eternity with Him in His glory. He did not come to be served but to serve. He became the servant of all, serving us to the point of giving His life for us as a ransom, paying the price of our sins and buying us back for God. James and John ended up receiving a much better answer to their request than they imagined. They did not get to sit at Christ’s right and left in an earthly reign, but they have received the special place Jesus prepared for them in His Father’s house in eternity [Jn. 14:2]. This promise is for you also. It was made to you in your Baptism. So repent of your selfishness, and let not your heart be troubled. Despite your selfish, misunderstood requests, Jesus will give you something far better than what you request. Jesus said, “Believe in God; believe also in me. In my Father’s house are many rooms. If it were not so, would I have told you that I go to prepare a place for you? And if I go and prepare a place for you, I will come again and will take you to myself, that where I am you may be also [Jn. 14:2-3].” To this clear promise of Christ we can cling, knowing that He is referring to our eternal heavenly home, away from this world of selfishness and lording over others. There we will spend eternity in bliss with all believers in Christ. Amen. The peace of God which surpasses all understanding will keep your hearts and your minds in Jesus Christ our Lord. Amen. Thanks for this excellent, clear explanation of this passage.